C. Iordanoglou & M. Matsaganis ABSTRACT - Grexit was narrowly averted in summer 2015. Nevertheless, the view that Greece might be better off outside the Euro area has never really gone away. Moreover, although Marine Le Pen’s bid for the French presidency was frustrated in May 2017, in Italy a disparate coalition, encompassing Beppe Grillo’s Movimento Cinque Stelle as well as Matteo Salvini’s Lega Nord, has called for a referendum on exiting the Euro. In this context, our argument that Grexit cannot save Greece may be of some relevance to national debates elsewhere in Europe. The paper examines the case for Grexit by offering a detailed account of its likely effects. Its structure is as follows. Section 2 analyses the transition, with the two currencies (old and new) coexisting. Section 3 charts the challenges facing the Greek economy in the short term, after the new national currency has become legal tender. Section 4 assesses prospects in the medium term, with Grexit complete and the new currency drastically devalued. Section 5 reviews the underlying weaknesses of Greece’s growth regime and explains why these are unrelated to the nominal exchange rate. Section 6 discusses the conditions for an investment-led recovery, and shows why tackling them would be more difficult outside the Euro area. Section 7 sums up and concludes. C. Burelli ABSTRACT - This paper tackles the notion of solidarity in the EU from a realistic perspective and aims at clarifying two common flaws in the arguments of many who invoke it: vagueness and utopianism. I have two aims: to clarify the concept of solidarity, and to offer a realistic justification for its application to the EU. To make sense of the heterogeneous history of the concept, I suggest distinguishing it from charity, which is spontaneous and universal, and from fraternity, which relates to a mere emotional sense of fellow-feeling. This less demanding conception of solidarity can be realistically defended as instrumental to stabilizing political cooperation within the EU, and as such it is in the long-term enlightened self-interest of all its members. I. Madama ABSTRACT - The working paper deals with a recent EU social initiative - the Fund for European Aid to the Most Deprived (FEAD) -that from the RESCEU perspective, despite its narrow scope, can be understood as a puzzlingcase of “reconciliation” at the EU level. Launched in 2014 to contrast severe material deprivation, the FEAD was meant to represent in symbolic terms a way to both increase the visibility of EU action in the social field and to stem the harshest social consequences of the economic downturn.By focussing on this program,targeted to the lower tier of pan-European solidarity, the paper has two main goals. First, from a descriptive standpoint, it aims at providing an overview of the main institutional features of this novel component of the European social sphere. Interestingly the empirical reconstruction of the long process that brought about the adoption of the FEAD shed light on a peculiar historical pathway that took the form of a slow moving process of transformative yet gradual institutional change:not a big transformation in response to big shock, rather an incremental change with highly transformative results (Streeck and Thelen, 2005). Second, from an interpretative standpoint, the paper advances some preliminary hypotheses on the political and institutional dynamics behind the adoption of the new scheme, that appears puzzling on two fronts. On the one side, it represents an unlikely case of supranational activism in the social sphere in an expansionary direction, that occurred within a scenario of overall de-conciliation and econocratic negative integration (cf. Ferrera, 2014). On the other side, it affected a policy field – the fight against poverty and social exclusion – which is particularly unlikely to be Europeanized, since it is typically characterized by a strong defense of national sovereignty. Not surprisingly, findings suggest that the adoption of the FEAD resulted to be a contested and contentious decision, that fostered the emergence of harsh tensions. Despite this, the institutional and political sponsorship of the proposal proved to be strong enough to have the Commission’s initiative not only passed but even strengthened, in terms of scope and financial budget, during the legislative process. F. Costamagna ABSTRACT The paper analyses the demise of the Rule of Law in the EU economic governance, after the reforms enacted to respond to the economic crisis that hit the region after 2008. The analysis engages critically with the marginal role played by the Court of Justice in this context and, in particular, when it comes to the protection of social rights in time of austerity. The paper demonstrates that this situation is only partially attributable to “external” constraints, such as the choice to resort to mechanisms that are outside the EU legal order or the strict requirements concerning the locus standi of private applicants that wish to challenge the validity of EU acts. So far, the Court has been unwilling to fully perform its role, even in those cases where it could have done so. 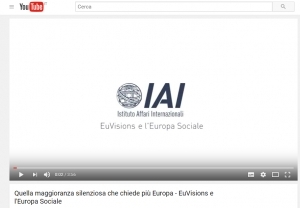 P. Pansardi and F. Battegazzorre - ABSTRACT In this article, we investigate whether and in which way the institution of the State of the Union Address, delivered annually by the President of the Commission to the European Parliament, has provided a setting for communication and top-down legitimation of the EU. Our analysis is based on a qualitative content analysis of the five State of the Union speeches delivered between 2010 and 2015, and is aimed at identifying the discursive legitimation strategies employed in the speeches and the particular conception of the legitimacy of the EU that emerges. Our findings show the presence of a number of elements of discontinuity that characterize the passage from the speeches by Barroso (2010; 2011; 2012; 2013) to the one pronounced by Juncker in 2015, and highlight a difference both in the discursive legitimation strategies employed and in the conception of the legitimacy of the EU that they promote. F. Stamati - ABSTRACT This paper proposes the concept of Union-leadership for the study of polity-building at the EU level. It draws on Ferrera’s diagnosis of a de-conciliation between market-making and market-correcting developments in European integration in order to formulate the following puzzle: why political agency is letting the EU polity project falter? The concept of Union-leadership is presented as a tool to tackle this question from a Weberian perspective. The paper is structured as follows. The first section tentatively formulates the concept of Union-leadership. The second specifies the logic of action of Union-leadership within a neo-Weberian framework. The third one further develops the concept by discussing a number of qualifications needed to sharpen the analytical focus on personality and statecraft. The paper concludes by assessing the limits and prospects of Union-leadership for studying the current political crisis of the EU. M. Ferrera - ABSTRACT Just like security and peace, organized solidarity is a key political good for a stable and effective functioning of both the market and democracy and for mediating their inevitable tensions. In historical perspective, the national systems of social protection can be seen as the end result of a long process of ‘bounding’, ‘bonding’ and “binding” . During the twentieth century, the consolidation of territorial borders and of “nationality” filters (bounding) fed increasingly stronger sharing dispositions (bonding) among citizens, allowing for the establishment of compulsory mass social insurance (binding). In the absence of strong state boundaries eliciting mutual ties among insiders, the political production of organized solidarity (i.e. public welfare systems with high redistributive capacity) would have been impossible. As highlighted by the so-called ‘state-building school’ on political development, the formation of the European Union is partly replicating – under drastically changed circumstanced – the process of boundary-building which, starting from the sixteenth century, led to the modern system of nation-states (Bartolini 2005; Ferrera 2005; Flora 2000). This time around, however, the bounding–bonding-binding nexus is considerably more complicated and its activation cannot be taken for granted. While incisively re-drawing economic boundaries, the EU has indeed adopted a growing number of social provisions -some of them binding. But the construction of a “Social Europe” is faced with a daunting mission, as it involves putting in place a new, socially-friendly boundary configuration by working at the margin of the traditional and highly resilient set of state boundaries, nation-based bonds and binding redistributive schemes. This means engaging in dangerous balancing acts between “opening” and “closure”, with a view to cultivating pan-European sharing ties and crafting at least a minimally adequate system of inter-territorial and inter-personal redistribution, without however jeopardizing national systems. In the absence of a modicum of collectively organized solidarity, a complex and heterogeneous institutional construction such as the EMU is unlikely to reach viable levels of political stability.This paper has four aims and sections. The first is to redefine analytically the very ambiguous notion of Social Europe and to identify its various components. The second is to connect this analytical redefinition2with the idea of a European Social Union (ESU) which I currently see as the most promising project for re-organizing solidarity on a European scale. The third aim is discuss some normative principles which might underpin the most delicate dimension of the ESU project, i.e. encouraging cross-national bonding and binding. The fourth section will finally try to highlight the political rationale of such principles and explain why the ESU should be considered as a key “political good”. The conclusion wraps up and reflects on possible scenarios. M. Ferrera - ABSTRACT Reorienting the welfare state towards Social Investment (SI) constitutes a complex and multidimensional challenge of policy recalibration and raises daunting political problems. The temporal mismatch between SI reforms and their returns requires a degree of ‘political patience’ on the side of both current voters and incumbent politicians which is not readily available in contemporary democracies. After reviewing recent debates about the policy and politics of the long terms, the paper analyzes the strategy pursued by the EU, with a view to assessing their degree of ‘conduciveness’ to SI recalibration. It is argued that the EU has indeed stimulated policy change at the national level, but that its potential as SI facilitator has been hamstrung by a number of weaknesses and shortcomings, especially on the discursive front. A more convinced and articulated endorsement of the social investment paradigm and a more focused attention to ‘capacity’ at the subnational and grass-root level should be the fronts to prioritize. M. Ferrera - ABSTRACT The intra-EU mobility of workers/persons (and in particular the latter’s access to the social protection systems of the receiving countries) is becoming an increasingly contentious and polarizing issue and is occupying the center stage in the so-called Brexit debate. The UK government is asking major restrictions of current legislation and other member states are very sensitive to this issue as well. Challenging the principle of free movement is no trivial matter. What is actually put in question are not only the foundational pillars of the single market, but of the EU as such, understood as a single (would-be) polity.The aim of the paper is to offer an analytical framing of this challenge. The next section will provide a brief historical reconstruction of welfare state building at the national level, highlighting the salience of boundaries and of the “bounding-bonding” nexus. It will also discuss the impact of European integration on the intra-EU boundary configuration in the sphere of solidarity. Section 2 will illustrate the state of play as regards mobility, summarizing the findings of empirical research on the economic and financial implications of free movement and of the social security coordination regime. Section 3 argues that –in addition to economic efficiency- the principle/logic that underpins free movement is that of “hospitality”, rather than the more general principle of solidarity. The section then discusses some unintended practical implications that follow from the logic of hospitality and that lie at the basis of the increasing contentiousness around free movement. Section 4 will discuss possible institutional remedies for containing political contention. The underlying assumption is that the preservation of free movement is key for the survival of the EU qua political association/community and that such preservation must be the object of an essentially political (and not merely functional) strategy on the side of EU authorities. The conclusion wraps up.